I think I did OK, for being a novice! 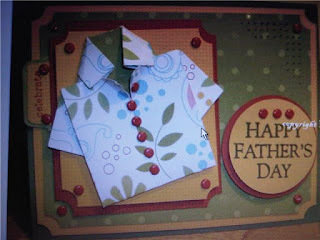 ha ha ha I love the shirt on the card, and I learned to fold those long about 6th grade or so.... it was a real stretch to try and remember just how to fold them, but after a few tries, it all came rushing back to me! Whew! My card is not nearly embellished as hers is, but hey, I'm on a budget here! hahahaha When I grow up, I wanna have TWICE the supplies as Markie's Mom!!!! !